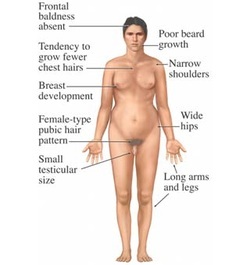 Klinefelter syndrome may present with tall stature,mental retardation, atrophic small testes, gynecomastia, infertility and lacking of secondary male characteristic with reduction in spermatogenesis. Klinefelter syndrome occurs with two or more X chromosome with one or more Y chromosomes such as 47 XXY and the present of single Barr body. Patient with Klinefelter syndrome may present with increase in the FSH and LH level with reduction of the testosterone level.The treatment of Klinefelter syndrome will focus on replacement of the testosterone.